Creating With A Difference: Join the fun! 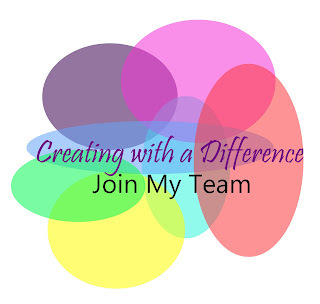 So today I thought I would talk about how to join my team! It doesn’t matter if you’re in the UK, Austria, France, Germany or The Netherlands, I am building a fully international team. Joining Stampin' Up! is one of the best decisions you can ever make in your life. Whether you want to do this as a business or just buy for yourself and your own hobby there is something for everyone! You can simply join just for the starter kit which is the best deal in the catalogue or you can stick with it and see if this is the business for you. My team are affectionately known as 'Charleyz Stampin' Angelz'. I would be beyond honoured if you joined under me. Simply click on the image above to join now! We have a dedicated facebook group and meet up as often as possible. If you aren't close enough to catch up then there is always phone, skype, facebook live, periscope, email, text and I am sure thousands more options. As well as my direct team there is also our extended team which have their own facebook page so there is always someone to talk to and ask questions. There are always new people joining so you are never alone. I have also started a facebook group for disabled demos and I have created a disabled access guide to all events. There is support from so many people. Demonstrator support are quite honestly the greatest customer service I have EVER encountered. What are the minimum sales requirement? You only need to submit 300 CSV (commissionable sales volume) per quarter (3 months). That is less than the average Stampin’ Up! Workshop! Also, you can submit your sales in any increment you wish and still receive a 20 percent discount and commission (or 25 percent if you have come apparently or above). What if I want to do this as a hobby and not necessarily as a business? Yes, you can do your own house anytime you want. Invite your family and friends into your home and have a workshop. You will be the hostess, receiving the Stampin’ Rewards, as well as the demonstrator receiving your instant income and commission. The starter kit is only €129/£99 and is fully commissionable. You choose up to €175/£130 worth of any current Stampin’ Up! products, and you also receive a business supplies pack containing materials you need to run your business valued at €30/£25 PLUS free shipping. You can earn money in three ways: instant or deferred income (20 or 25 percent of each order), monthly volume rebate (4-13 percent of total monthly sales), and monthly team conditions (1 to 6.5 percent of your recruit sales). Do I have to recruit at the demonstrators? No. If you were to recruit demonstrators, you would be paid commissions on your team’s sales, but this is a perk, not requirement. Where will I get project ideas for my workshops? What kind of training tonight expect? Stampin’ Up! provides dozens of training resources filled with project ideas and tips to help you in every aspect of your business, including a quarterly publication called Stampin’ Success, demonstrating support agents, a demonstrator-only website, and annual and seasonal catalogues. Is Stampin’ Up! well-known respected company? Since 1988, Stampin’ Up! has been selling stamps and paper-crafting supplies. In that time, not only have we won industry awards and accolades, but also the loyalty of demonstrators and customers alike. And that is a trend that we work hard to maintain. You can rest assured that the reputation of Stampin’ Up! Will only continue to improve. The company celebrated its 10th year in Europe in 2017 and will be celebrating its 30th year in the US in 2018. What if I decide I don’t like it once I started? Will I be penalised if I quit? You may choose to stop at anytime, and you will not be penalised. You simply stop placing orders. However, there are many benefits to remaining an active demonstrator. 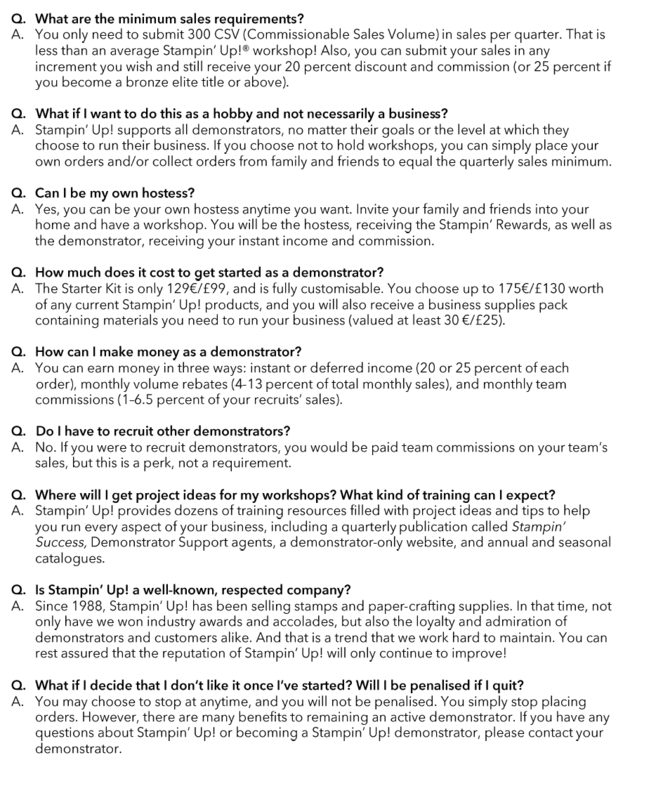 If you have any questions about Stampin’ Up! Or becoming a demonstrator please contact me Charley Zakrzewski aka Creating With A Difference. Another great bonus to becoming a demonstrator is that you get to keep your starter kit even if you leave straight away. The quarter that you signed up in is classed as a grace period therefore you don’t have to start meeting your minimums until the second quarter. That means you have some thinking time whilst playing with all your goodies. I have beena demo 3 times and this has been the first time I have done this as a business. The first two I was just a hobby demo. Labels: become an angel, crafting, creating with a difference, disabled, disabled artist, disabled stampers, handmade, handmade card, join me, Stampin' Up!